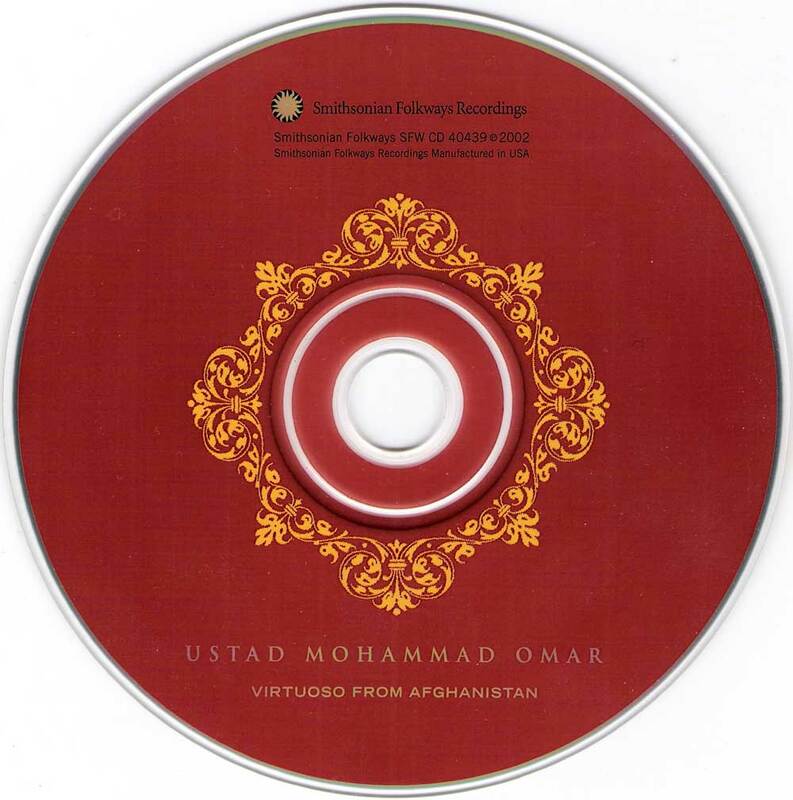 Virtuoso From Afghanistan is a 2002 CD by Ustad Mohammad Omar. This was recorded in 1974. 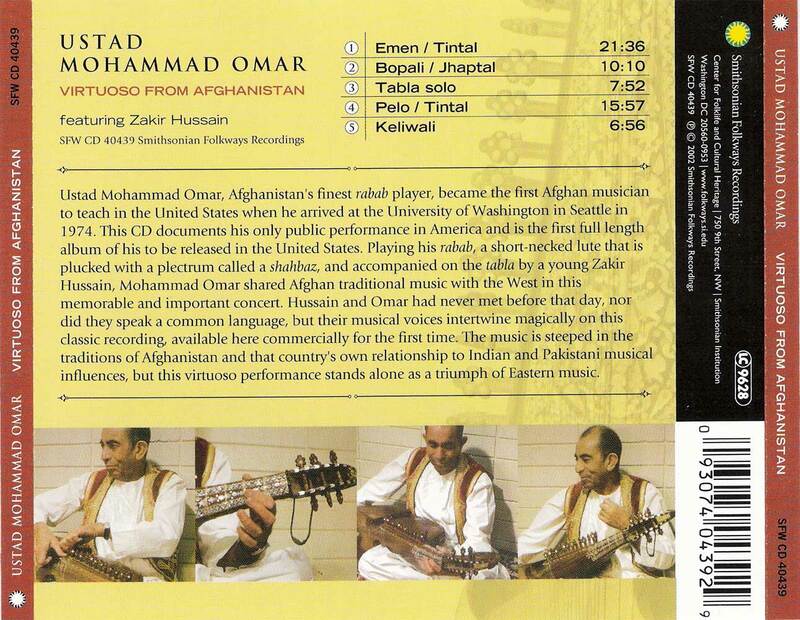 Omar plays an Afghani instrument called the rahab and is joined by legendary tabla player Zakir Hussain. It is released by Smithsonian Folkways Recordings. The late Ustad Mohammad Omar was, perhaps, Afghanistan's greatest musician, a virtuoso on the rabab (a plucked lute that's the ancestor of India's sarod) who was largely responsible for making the folk instrument into something classical. This album – from the only concert he played in the U.S. while teaching at the University of Washington in 1974 – is a remarkable endeavor. 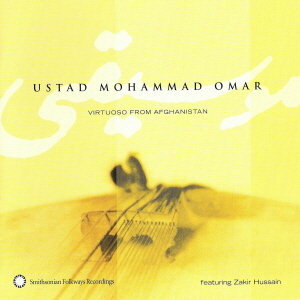 Not only does it showcase his superb playing on a selection of Afghani classical pieces, but it teams him with Indian percussion master Zakir Hussain, the pair playing together with virtually no rehearsal, although it's impossible to tell that much of this was moved by spirit rather than practice (and most will never even notice that Omar breaks a sympathetic string on the rabab during the first track). The five pieces are extended, wonderful meditations that follow a standard formula of improvisation followed by the composition in a fixed melodic mode and rhythmic cycle. It's Omar's improvisations that truly startle, even more than the beauty of the compositions themselves. His fingers are fleet and the complex patterns he makes are entrancing – to try and follow them becomes an almost impossible task. To be fair, the album's far from easy listening; it demands a great deal of concentration, but rewards it magnificently (and kudos to Hussain, who inserts himself into the music as if born to it). Things do lighten up with the relatively short final cut, "Keliwali," a popular Pashtun folk melody, exquisitely performed. As a reminder that Afghanistan is a country with a proud cultural heritage – and its own wonderful musicians – this is vital.